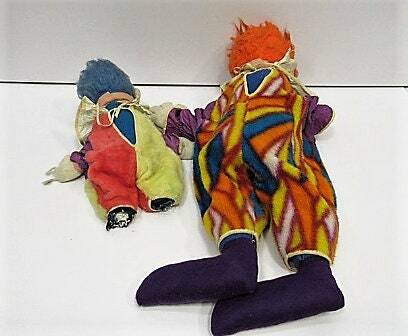 Large Pair of 1950s Ideal Stuffed Clowns, 27 and 14, horrifying! 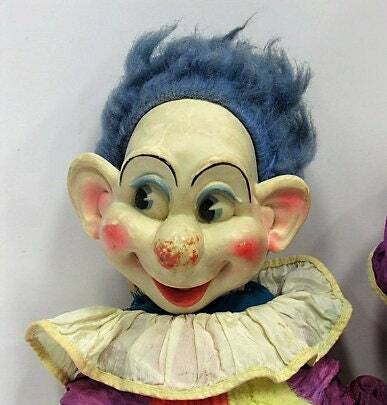 Large Pair of 1950s Ideal Stuffed Clowns, 27" and 14", horrifying! 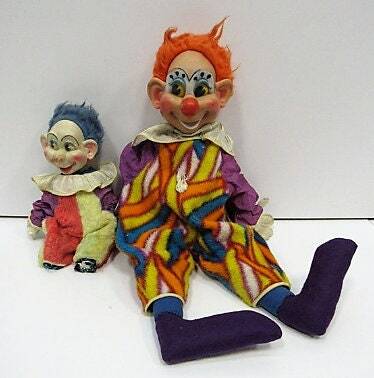 Wow, here's a great pair of horrifying 1950s stuffed clowns! This is something that, like our re-homed Ouija Board, Ginger would feel much more comfortable being at your house than ours. 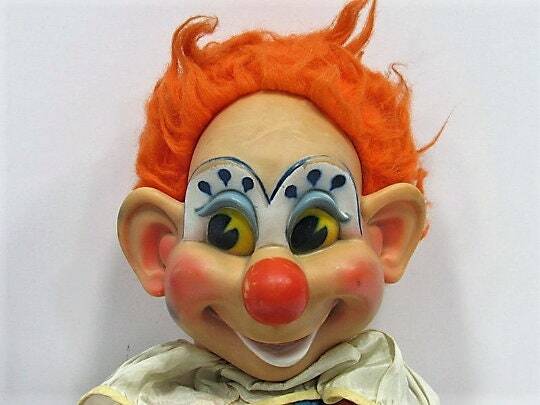 These clowns make the Poltergeist clown look like Emmett Kelly. These are the kind of clowns who like to hang out with Pennywise. 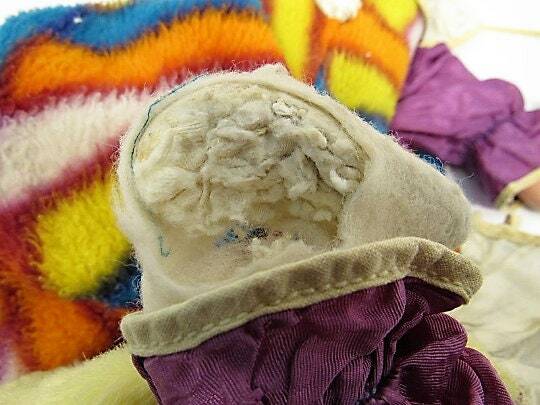 Please note they have some wear and tear as seen in the pix. Both of them wear drug-crazed faces (part of the CIA LSD experiments back in the day perhaps? ), and appropriately "jolly" outfits. Both also have some injuries which makes them creepier. The little one (14" high) seems to have had his feet gnawed off, and he has defensive wounds on one hand as you can also see in one of the pix. 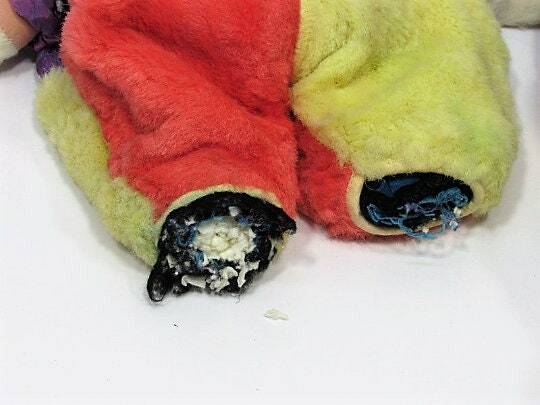 These gruesome injuries just make it even creepier. The big one (27" high) has some wear and tear but pretty solid. 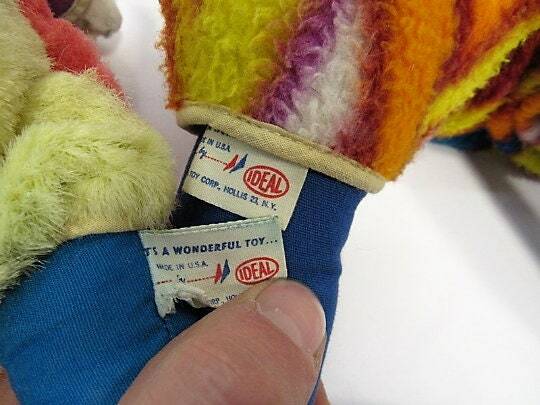 I also note for fans of NYC, that Ideal was based in Hollis, Queens, NYC. So not only was moms cooking chicken and collard greens, but Christmas also saw some freaky scary clowns in Hollis, Queens.